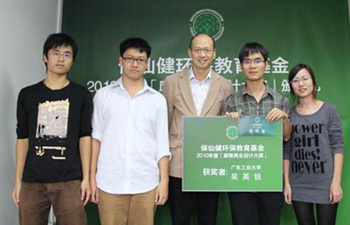 GUANGDONG UNIVERSITY OF TECHNOLOGY, a key provincial university, is the only tertiary institute where teachers and students work together pooling their resources and knowledge to mobilize all the teachers and students to contribute to environmental protection. 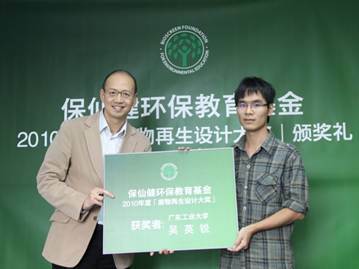 In the spirit of "energy conservation" and "environmental protection", they established the ENERGY CONSERVATION and ENVIRONMENTAL PROTECTION ASSOCIATION (ECEPA) to promote the green concept, energy conservation and environmental protection awareness. The Association, now in its 3rd year, has continuously been making remarkable contributions to environmental protection. Teachers and students participate every year in government and educational institutes' activities and competitions-Guangdong Students Science and Technology Festival, environmental design contests and environmental research seminars etc. 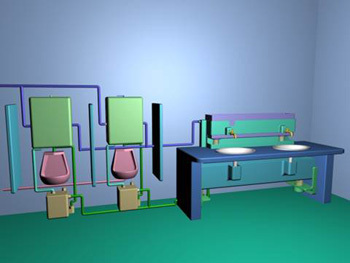 Award winning work: Wu Ying-rui's "Automatic reused water toilet system device"
While toilet flushing uses a large volume of fresh water, "used water" from hand-washing and bathing etc is discharged as waste. With view to conserve water and energy, Wu Ying-rui's design tackles this problem by making use of water pressure as spring energy which in turn brings on pressure that sends water upward for toilet flushing. It is automatic and works without electricity. The system's devices include: a pressure transformer, a water storage tank, a second water tank and a pressure tank. It is suitable for installation in public washrooms as well as family bathrooms. Mr. Wu's work gained the recognition of BIOSCREEN FOUNDATION. 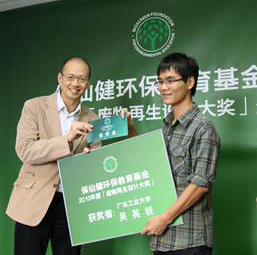 Its Chairman Dr. Raymond Liu personally presented Mr. Wu the certificate and prize scholarship for the 2010 BIOSCREEN ENVIRONMENTAL AWARD FOR WASTE RECYCLING on 15th November 2010 in encouragement to him to continue his good work on environmental protection. 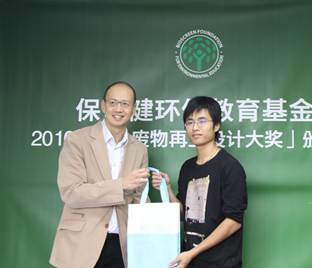 Dr. Liu presents souvenirs to representative of the ECEPA of the GUANGDONG UNIVERSITY OF TECHNOLOGY in acknowledgment of their contribution to environmental protection. ©Copyright 2003-2010 Bioscreen Foundation. All Rights Reserved.